Simple? YES! But imposible… That i’m doing wrong? then i’m already put some text inside content box, i can’t put an image or icons. Only if image or icons first. I tried - don’t work. 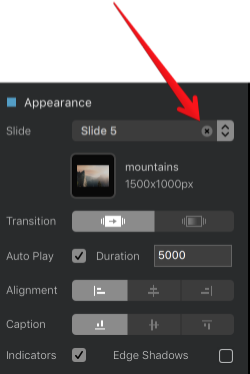 When I try to select an “extra” slide, the selection is reset and one of the “real” slides is again selected. In fact, there are no slides in HTML code. Looks like the problem is caused by the fact you have an image within an image. The current carousel will work fine if you add extra text into the content area but if you insert an image it gets messed up. I’m working on improving this for 2.4.2 beta build 2. Great!!! Will wait, thank you!